Red Queen Welcome bonus is set for the player first three deposits. Not many casinos offer such a high number of casino game providers as Red Queen Casino. Red Queen Casino will make you feel like a celebrity right from the start, with its plethora of bonuses. Hundreds of diverse games provided by 10 software developers are available on mobile devices and promise to keep players entertained. Red Queen Casino is an online gambling operator with a keen eye for the UK market. The fact that it is based in United Kingdom explains the preference for the local audience. However, players from all over the world except for Nigeria and the United States can sign up for an account. The license issued by the UK Gambling Commission allows it to cater for all those players who reside in a country where online gambling is legal. Instead of dwelling exclusively on the games provided by a single software developer, Red Queen Online Casino chose to expand its scope. It works with 1x2gaming, NYX, Playson, Thunderkick, Elk, High 5 Games, Lightening Box Games, Saber Interactive, Incredible Technologies and Cryptologic. As a result, there are hundreds of different games to enjoy here, each original and special in its way. This Red Queen Casino review will shed some light on the security protocols in play here. The online gambling operator is diligently working to protect players from the harm coming from outside. The Internet can be a treacherous place, especially for those who don’t know a great deal about the perils lurking in plain sight. There is no shortage of cyber criminals and wrongdoers who wait for the perfect opportunity to strike. The SSL encryption is in place to deter all these bad guys and in conjunction with firewalls, keeps players secure. Information is encrypted and the same goes for the amounts transferred by players who deposit and withdraw cash. The UK Gambling Commission demands all licensed casinos to employ the latest technologies to keep customer secure. They also require players to have the games audited for fairness, so players are never deceived by the RNG. Cryptologic, Nyx Interactive, 1x2Gaming, Thunderkick, Elk Studios, Lightning Box, High5Games, Saber Interactive, Incredible Technologies and Playson provide games. 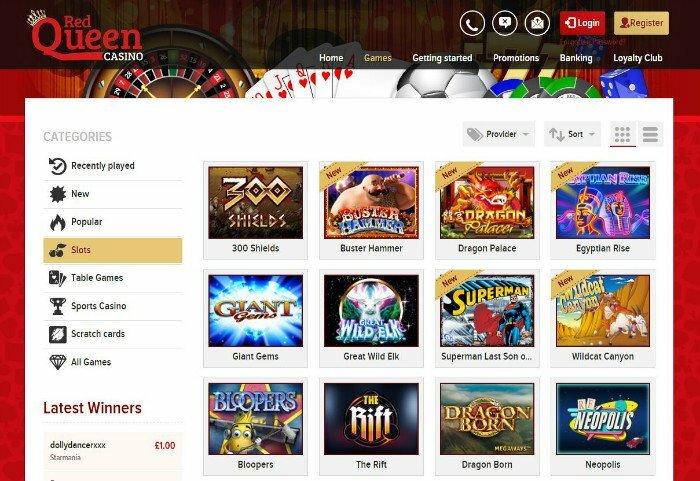 Red Queen online casino is thrilled to be able to offer this impressive variety of slots, table games and video pokers. They can afford to cover all angles and offer slots belonging to both 3 and 5 reel varieties. Celebrity Jungle, Sunny Scoops, Flash, Treasure of the Pyramids and Lucky Pirates are some of the games that have developed a cult following. Red Queen Casino games are also providing players with a chance to gamble against real dealers. The restrictions are the same that apply to all online casinos, as only table games are compatible with this format. Blackjack, baccarat, sic Bo and European roulette fall into this category, but other table games are also offered. Chinese Roulette, Sharp Shooter, Blackjack Player’s Choice and TXS Hold’em can be enjoyed against the proven fair random number generator. The Brancd has recently enhanced its collection of arcade games with 20 new titles. Grand Prix Gold, KenoLab, Darts 180 and Reality Shootout are all fine alternatives for those who seek different thrills. The video poker variety leaves a lot to be desired however, with just three types on the offer. On the bright side, the payouts are clearly displayed in the tables available next to each game. Red Queen Casino payment methods include the most reliable and effective financial instruments. You can make deposits and cash out your profits using Entropay, MasterCard, Neteller, Skrill, Visa and Visa Debit, Visa Delta, Visa Electron. There is a clear advantage for electronic wallets who take less than 24 hours to process cash outs, as opposed to credit cards and bank transfers. The latter will require up to five days and players can cash out no more than €3.000 per day. Customer support is available from 9 AM to 5 PM GMT, another proof that Red Queen cherishes British customers. They should consider the possibility of offering 24/7 assistance, for those who reside beyond borders. British players benefit from the advantage of using toll-free numbers for clients that rely on the live chat and email. Red Queen online casino will offer £10 for free to all those who sign up for a real money account. The perks of this introductory offer is that the money is awarded for free and with no strings attached. You don’t even have to make a deposit or use a promotional code. The only thing that is expected from players is to press the play now button and register using a mobile number. A verification code will be sent via smartphone in less than 10 minutes and the bonus will be available right away. Red Queen Casino bonuses get more generous as players make the first deposit which is matched by 150%. The amount is limited to €150 or currency equivalent, so players should be aiming for a deposit of €100. A bigger investment will not trigger a bigger payout, but the exceeding amount won’t be subject to wagering requirements. Speaking of which, one would have to play the bonus through a minimum of 30 times before a withdrawal is accepted. Unlike other casinos who offer all the bonuses at once, this one will also double the second deposit. The ratio at which the deposit is matched has reduced, but the amount is significantly higher and players can collect €200. Even the wagering requirements get easier to meet and once you play this bonus through 25 times you can cash out. Red Queen Casino will make sure that players know at all times how much money they still need to clear. Last but definitely not least, the third deposit is matched by 50% and this time players can claim a maximum of €500 if they only deposit €1000. This is the perk of being a loyal customer, since perseverance is much appreciated here. By this time, players should be well familiar with the wagering system but they are in for another pleasant surprise. This huge bonus happens to be the easiest to redeem because you only need to play it through 20 times. There is also a loyalty scheme for those who play the long game and keep reloading their accounts over and over again. Comp points are accumulated by those who spend real cash, regardless of the outcome of their gambling session. The Red Queen Casino bonus that can be redeemed by turning in these points is limitless. Those who are willing to spend a lot of time playing exclusively here, will move up the ladder and eventually attain VIP status. 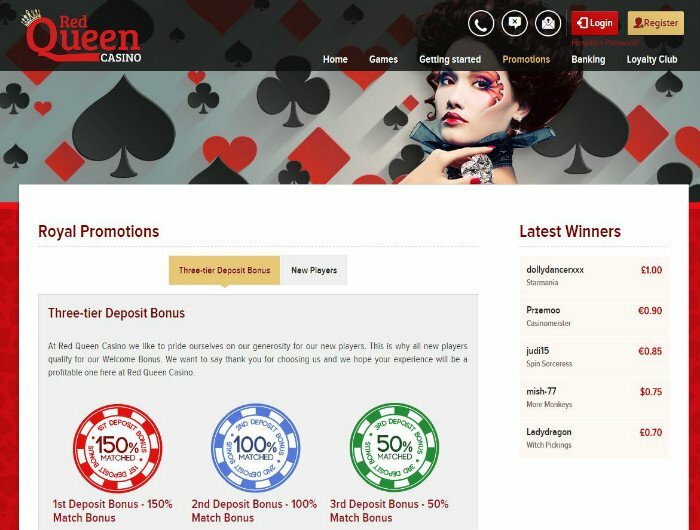 redqueencasino.com made its top priority to make the wildest dreams come true. It took it a while to build a solid reputation from scratch but the results speak for themselves. The company that owns the casino was founded more than two decades ago. As a result, it had plenty of time to make itself known. No compromises were made when it came to security and that’s why they chose to abide by the rules of the UK gambling commission. This means a great deal today when many UK operators flee the country to dodge taxes. This Red Queen Casino review has highlighted the advantages of playing here. The technology used is state-of-the-art and this goes beyond the games offered. By signing a deal with so many software developers they make sure that players will never get bored. The promise the casino makes is that you will always find something new and exotic to enjoy here. All games can be played on virtual currency, but those who are ready to make the transition to real cash will have reliable payment methods. Give this casino a try and see for yourself why so many of those who sign up never leave for another operator. The bonuses, promotions and special offers will grow on you and provide you with the impetus to persevere. As an online casino enthusiast and strategy analyst, I naturally feel comfortable with variety and challenge. This industry suits me perfectly and I love what I do now. According to me and my personal experience with casino games, strategies can be used multiple times with endless variations. After all, it is all about the way we do things. I love exploring these strategies and variations, and I prefer casino games over any others.